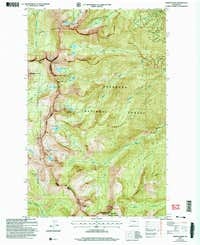 The Chelan Sawtooth Wilderness is a sub-range of the Washington Cascades located just east of the glacier scoured Lake Chelan. The range parallels the lake for over 25 miles trending northwest and southeast. 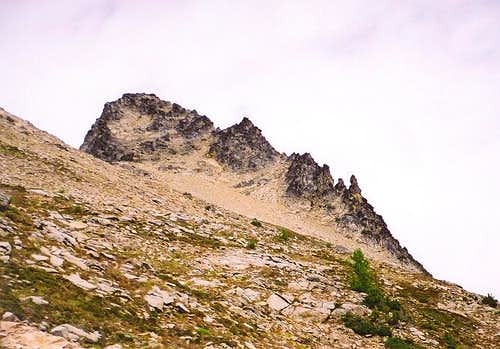 Many high peaks are found here including a handful of the Bulgers however most of the area is characterized by gentle talus slopes, an occasional steep north face and an abundance of alpine larch trees. In fact, October may likely be the best time to visit the area since the alpine larches will be in their full golden glory and places like the Oval Lakes Basin, Eagle Lakes Basin, and the Bernice Lake Basin would shine a brilliant gold in the fall. 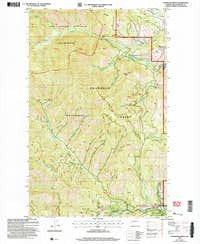 This area is also characterized as being very remote requiring long trailed approaches and long, rough drives to get to the trailheads. 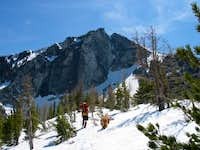 The Chelan Sawtooths have a unique feel unlike other mountains in Washington and has something for everyone from the weekend hiker to the seasoned mountaineer. Another thing to note about this area is the fact that no glaciers are found here, despite having such a high elevation. The rain-shadow effect is clearly seen here as peaks further west that lie over 1000 feet lower in elevation are completely covered in glaciers year-round. 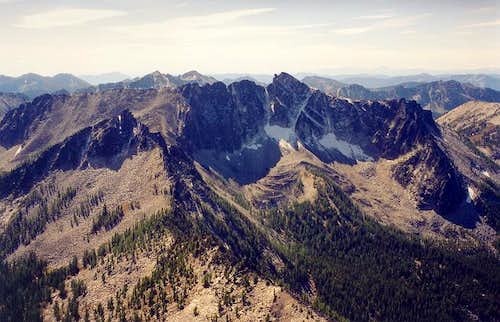 The east side of the Cascade Crest which includes the Chelan Sawtooths and the Pasayten Wilderness, receives less than half the moisture the west side does and this has a dramatic effect on the landscape. Winters here are colder, drier and windier giving it a more continental snow pack similar to Colorado. This unfortunately means the winter avalanche dangers are usually worse despite friendlier skiing terrain. Summers are warmer and drier than the west side making those hikes and climbs during midsummer very hot. One thing to note about this area is that many of the trailed approaches are actually outside of the wilderness boundary and motorcycle/snowmobile traffic is allowed. This has caused extensive damage to the trails and since horses are even allowed in the wilderness, many of the trails are rough to hike on, despite being a fairly gentle grade. For those who play the numbers game, the highest peak in the wilderness is 8,898 foot Gardner Mountain. 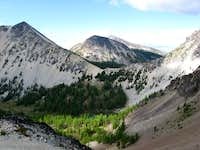 For the most part though, whether you are enjoying a relaxing hike on one of the many trails in the area, or embarking on a multi-pitch technical rock climb of the North Face of Star Peak, you will enjoy your time here. 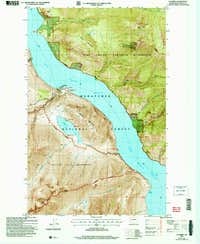 Don't degrade this area simply because there are less glaciers and gentler terrain. It is still beautiful. 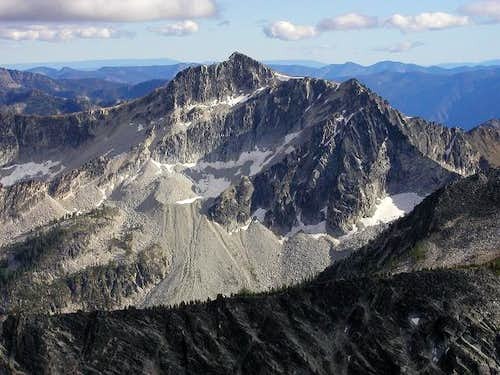 See the table below for a list of the Bulger Peaks in the Chelan Sawtooth Wilderness. There are many different trailheads one can use to access the Chelan Sawtooth Wilderness, most of which are on the east side and require long drives on rough dirt roads. There are however a couple access points from the west involving a ferry ride up Lake Chelan. Described below are detailed directions to each of the major trailheads from north to south. The nearest town is Twisp and this is the place to stock up on supplies and the only place in the area with full services. Twisp is a short distance from the WA Highway 20 and 153 junction which is a 4 hour drive from Seattle on US Highway 2 east, US Highway 97 north and State Highway 153 north. From Spokane the drive is just over 3 hours heading west on US Highway 2 past the Grand Coulee Dam. This trailhead is accessed by driving north for 8 miles on WA Highway 20 towards Winthrop but just before crossing the bridge over the Methow River, turn left (west) onto Twin Lakes Road (White Ave). Go 1.3 miles and turn right onto Wolf Creek Road. Continue 2.8 miles on this good dirt road then turn left onto Left Fork Wolf Creek Road. Go another 3.9 miles to a fork in the road. Stay left (going right will take you on Rodeo Drive) and continue 0.6 miles to the trailhead at 3,000 feet. The Wolf Creek Trail starts here and heads west for 10 miles to Gardner Meadows. From the intersection of WA Highway 20 (Division Street) and West 2nd Avenue in Twisp, head west on West 2nd Avenue which quickly turns into Twisp River Road. Follow this beautiful road and stay left eight miles from the highway, to stay onto NF-44. Go an additional 10 miles (18 total on Twisp River Road) passing by the Twisp River Inn at which point you reach a Y junction. Stay right onto NF-4440 and continue 6.6 miles to the end of the road where the old townsite of Gilbert is located at an elevation of 3,600 feet. 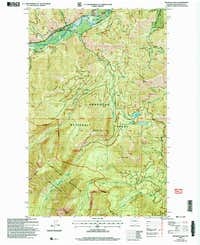 You will pass by the Poplar Flat, Twisp River and South Creek Campgrounds shortly before the road ends. The Scatter Creek TH is located 3 miles before the end of the road at the South Creek Campground where the Scatter Creek Trail heads to the namesake lake and provides access to the standard route on Abernathy Peak. Head west on the Twisp River Road from Twisp and continue left onto NF-44 per the Gilbert TH directions above. Go 6.3 miles on NF-44 (14.3 total from the highway) and turn left onto NF-4430 and continue another 0.7 miles. Turn left onto NF-100 and go 1.3 miles to the end of the road at 3,000 feet. The War Creek Trail heads west forever crossing War Creek Pass at the crest of the Chelan Sawtooths and descending to Stehekin. This is very close to the War Creek Trailhead described above. Head west on Twisp River Road and go 10.7 miles from the highway and turn left on West Buttermilk Creek Road. Continue 3.6 miles to a Y junction and head left onto NF-080. Follow this rougher road for 1.4 miles to the trailhead at 3,020 feet. The Eagle Creek Trail starts here and heads to Eagle Pass where you can access Courtney Peak or take the trail to Oval Lakes where you access the west side of Oval Peak. 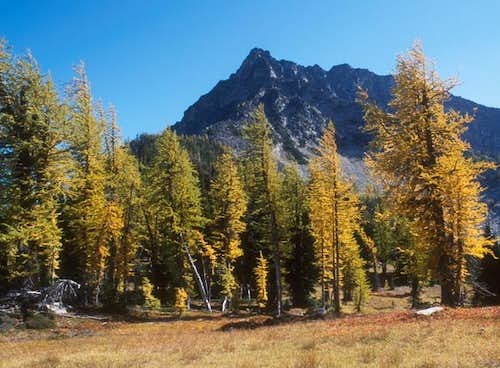 The larches in this area are especially beautiful in fall. Head west on the Twisp River Road for about 10 miles and turn left onto West Buttermilk Creek road. At the "Y" in the road veer right onto East Buttermilk Creek Road and go 3 miles before veering right on NF-500. Follow this road almost 3 miles to the trailhead which is at 3,800 feet. The trail heads south to Fish Creek Pass and on to Star Lake. This is the primary approach for climbs of Star, Oval or Courtney Peaks. From Twisp take WA Highway 20 east for 2 miles and continue south on WA 153 for 12 miles. 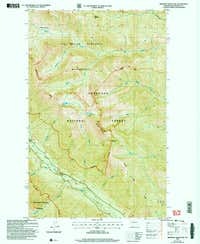 At milepost 19 turn right onto Gold Creek Loop Road and drive 1.5 miles to a T intersection. Turn left onto CR 1034, with signs for Foggy Dew Campground and measure from this point. After 1 mile come to a junction and continue straight onto FR 4340. The pavement ends at 4 miles (bear right), and at 5.4 miles reach an intersection where you turn left onto FR Spur 300 and follow this rough road to a large trailhead parking area at mile 10 with an elevation of 4,700 ft. The trail starts up a hot open area with many ruts from 4 wheelers but this goes away when you enter the wilderness. At the trail junction a ways up, taking the right fork leads to Crater Lake and the left takes you to the Eagle Lakes. 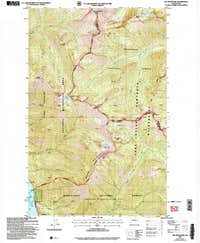 The Chelan Sawtooth Wilderness can also be approaches from Stehekin at the nrthern end of Lake Chelan however this is very rarely done. 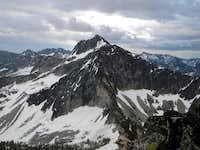 Nearly all hikers and climbers starting at Stehekin head into the heart of North Cascades National Park further to the west. Getting to Stehekin isn't trivial as you have to book a seat on the "Lady of the Lake" ferry which begins in the town of Chelan at the far southern end of the lake. See this page for more information about the ferry service including schedules and costs. Also be advised that a Northwest Forest Service Pass is required to park at any of these trailheads. If you plan to visit the area, or any other northwest trailhead frequently, it's wise to spend the $30 and buy the annual pass. Within the wilderness boundary, motorized vehicles, bicycles and dogs are not allowed. Please keep this area open and pristine for others to follow. 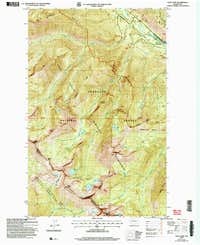 Campfires are also prohibited above 5,000 feet in elevation. Scattered around are a few good technical climbs in the Chelan Sawtooths ranging from low 5th class climbs to a few big-wall type ascents. 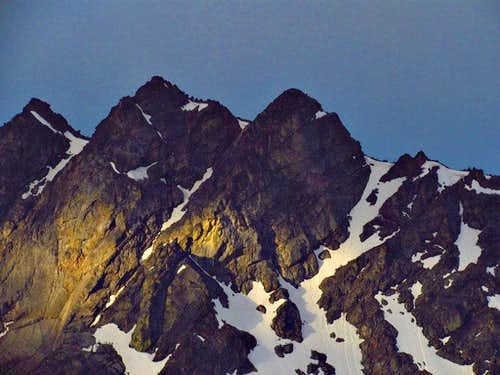 There is obviously the north faces of Star and Courtney Peaks which have seen very little activity however the northwest ridge of Star Peak starting from Fish Creek Pass has seen an ascent by John Mailhioti and Rolf Larson on September 7, 1997. It was reported to be a knife-edge until it steepens dramatically for the last couple hundred feet. 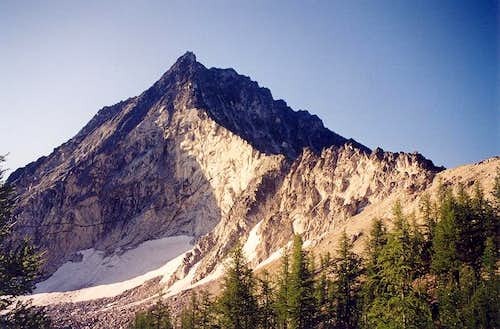 It was noted to be a Grade III, Class 5.7 climb. 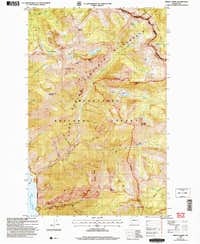 A new route was also put up on the north face of Courtney Peak on July 2nd, 2008 noted to be a Grade 3, Class 5.10 climb. See this page for more information. The Northwest Ridge on Reynolds Peak is a good moderate alpine climb with a 5.3 rating and solid rock. This sure beats the crummy talus slog on nearly every other route on this peak. 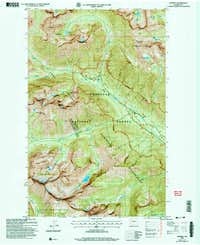 Below is a table of the USGS Quads for the Lake Chelan Sawtooth Wilderness ordered as they would appear on a reference map of Topos. Just click on the one you wish to see and view its full size.